This guide is intended to provide a comprehensive description of the encounter with Thok the Bloodthirsty in Siege of Orgrimmar. It is targeted at anyone who desires to understand the fight mechanics. Thok the Bloodthirsty is the eleventh boss in the Siege of Orgrimmar. This giant devilsaur is holding three friendly NPCs captive, and your raid will have to release them throughout the fight. Unfortunately for the NPCs, as soon as they are free, Thok devours them, obtaining their abilities and using them against your raid. This fight has a 10-minute hard enrage timer. There is a soft enrage in place that will cause your raid to take increasing damage after a certain amount of time. The fight against Thok the Bloodthirsty has two phases that alternate several times. That said, while one of the phases stays the same throughout the fight, the other changes somewhat each time your raid enters it. Phase One is the phase that the fight starts in. During this phase, your raid must fight Thok, who uses a number of abilities against your raid. The end of the phase is brought about by actions performed by your raid (although failing to end the phase for too long will eventually lead to a wipe). Phase Two is a transition phase during which Thok can no longer be tanked, fixating on random raid members instead. During this phase, your raid will have to free one of three friendly NPCs (Akolik, Gorai, and Montak), at which point Thok will kill them and the phase will end. This will cause your raid to re-enter Phase One, with the difference being that Thok's abilities in Phase One will be somewhat influenced by the NPC that he had previously killed in Phase Two. This alternation of phases continues until all 3 NPCs have been freed (so, your raid will go through a maximum of 8 phases). At this point, your raid will be stuck in Phase Two with no way to bring Thok out of it, eventually leading to a wipe. As we have explained above, and as we repeat below, your raid will enter three different variations of the same Phase One, each with slightly different abilities. Your raid is free to choose the order of Phase One variations, as we explain in the relevant section. Note also that it is probably not going to be the case that your raid will need to go through all three Phase One variations before Thok dies, but this will depend on the overall tuning of the encounter. Even though we have not yet explained what the abilities of each Phase One are, we feel it is important to stress right away the ideal order for the Phase One variations (which, we remind you, is determined by the order in which you free the three NPCs during the iterations of Phase Two). We strongly advise you to follow the order of Akolik, Gorai, Montak, as this promises to be the easiest way to execute the fight. Phase One is the phase that the fight starts in, and the phase that Thok will return to after each Phase Two (albeit with slightly modified abilities each time). Fearsome Roar is a frontal cone attack that applies a stacking debuff on affected players, causing them to take 25% more damage for each stack. This ability requires a tank switch. Burning Blood replaces Shock Blast. Burning Blood deals Fire damage to random raid members, placing a fiery void zone at their location. The strategy for Phase One depends on which instance of Phase One your raid is in. We will first present certain common Phase One tactics, after which we will discuss each variation separately. There are a few common elements shared between all variations of Phase One. The means for entering Phase Two is the same, and it is important to understand how this works. In order to force Thok to enter Phase Two, the minimum required number of raid members affected by the Bloodied debuff must stack together. Naturally, a pre-requisite of this is that the minimum number of players (5 in 10-man and 15 in 25-man are affected by Bloodied to begin with, something which really only happens once the raid starts sustaining sufficiently increased damage (caused by the increased frequency of Deafening Screech). The raid should stack up in all Phase One variations, except when you free Montak. There are two beneficial effects of this strategy. The first is that the raid is easy to heal, and the second is that your raid will automatically push Thok into Phase Two once enough players are below 50% health (which, given the fact that your healing is boosted by the raid being stacked together, is a good indication of when the damage has reached high enough values that exiting the phase is a good idea). It is important that the raid always stand to Thok's side, and never in front of or behind him. This is because Thok retains the cone attacks both in front of and behind himself throughout all Phase One variations. Every Phase One variation requires a tank switch, and the mechanics are very similar. In all cases, the debuff that requires a tank switch is applied to all targets in a cone in front of Thok, so the off-tank must remain out of this cone until it is time to taunt. Your healers will have to be prepared to heal the copious amounts of raid damage caused by Deafening Screech. As the frequency of these casts increases, raid cooldowns should be used. It is important that no one casts any spells when Deafening Screech is cast, in order to avoid being interrupted and locked out. This is especially important for healers, who need to be able to heal the raid as soon as Deafening Screech has been cast. It is also worth noting that the raid damage is complemented in every Phase One variation by some form of unavoidable damage on random raid members. heal the increasing raid-wide damage caused by Deafening Screech, as well as the damage from Shock Blast. Assuming that your raid is following our advised strategy of stacking up, then Thok will enter Phase Two as soon as the raid damage starts to get too high. To prolong the duration of Phase One, you should start using defensive cooldowns once the interval of time between Deafening Screech casts drops below 7 seconds. If your raid frees Akolik, the Phase One that follows will bring Acid Breath and Corrosive Blood to replace Fearsome Roar and Shock Blast. The strategy for this phase remains practically identical to the Basic Phase One strategy. Corrosive Blood is a DoT, so healers will have to keep an eye out on the players affected by this DoT, especially when Deafening Screech is being cast. If your raid frees Waterspeaker Gorai, the Phase One that follows will bring Freezing Breath and Icy Blood to replace Fearsome Roar and Shock Blast. While the strategy remains mostly the same as in the Basic Phase One, there are two notable differences. First of all, your healers will have to pay special attention to raid members who are affected by Icy Blood, especially when Deafening Screech is being cast, since the health of these players could drop dangerously low. Second of all, your DPS players will have to kill any ice tombs that trap raid members. The tombs have low health, but since players who are trapped take damage from the tomb, they must be freed quickly. Players who are trapped can be healed, and healers should make sure that these players do not die. Unlike most spells of this sort, the tombs do not have any sort of AoE effect, and they do not chain to nearby players, so stacking remains entirely viable during this phase. If your raid frees Warmaster Montak, the Phase One that follows will bring Scorching Breath and Burning Blood to replace Fearsome Roar and Shock Blast. The strategy remains very similar to the strategy for the Basic Phase One, with an important difference. The fiery void zones that players leave behind each time they are targeted by Burning Blood make it impossible for the raid to remain stacked up. This makes healing much more difficult, and it also requires a certain degree of coordination to have Thok leave the phase (since the raid will have to stack up on a synchronised fashion). Moreover, Thok himself will need to be moved repeatedly so that players are no hindered by the fiery void zones. Overall, this variation of Phase One is the most difficult one to handle. Thok remains fixated on the same player for 12 seconds, after which time he will change target. Throughout the phase, Thok's movement speed increases, such that after a while it becomes impossible to out-run him. It is important to understand the way in which Thok chooses his target, because the process is not entirely random. To begin with, Thok will only fixate on players who are more than 20 yards away from him. Out of these targets, Thok prefers to fixate on the farthest player from him, within a certain distance, which appears to increase with each new Fixate. So, Thok is most likely to choose the player Farthest from him within a 30-yard radius for the first Fixate, the farthest player within a 40-yard radius for the second Fixate, and so on. These rules are not exactly set in stone, and the boss will sometimes fixate on someone in violation of these rules, but they seem to apply most often. Note that the Corrosive Blood DoTs cast in the preceding Phase One will remain active during Phase Two (they will drop off at the end of it), causing additional damage to your raid. The strategy for this phase is very simple. As soon as it starts, everyone should move away from Thok in preparation for him choosing his first Fixate target. As soon as he has chosen a target, that player should run away from the boss in a predictable direction, while the rest of the raid must make sure to be out of Thok's path. The best way to handle Thok's fixate is to set raid markers at two locations of the room, about 50 yards apart, and to aim at having Thok kited between these two locations. The first fixated player should take Thok to location A, while other raid members should prepare to take him to location B when they get fixated upon, and so on. This allows the rest of the raid to have free access to the rest of the room. The Kor'kron Jailer should be picked up by the tanks as soon as he spawns, and all your DPS players should focus on killing him right away. After this, simply have a designated player loot him and open the cage of your choice. It is possible to DPS Thok during this phase, at the expense of prolonging the phase, and while this may be favourable in some situations, we have yet to see a good reason not to end the phase as quickly as possible. We recommend using Heroism/ Bloodlust/ Time Warp at the start of the fight. This is mostly because there is no specific reason to use it at a later time, and benefiting from all raid members having all their cooldowns available at the start is very advantageous. Tank Thok in such a way that neither his head nor his tail is facing the raid. Perform a tank switch and stay out of Thok's frontal cone attack until it is your turn to taunt. Pick up and tank the Kor'kron Jailer during Phase Two. Be prepared to heal the increasing raid-wide damage from Deafening Screech, and make sure not to be casting when Deafening Screech goes off. Beware of the combined damage of Deafening Screech and Shock Blast (or the ability that replaces it). Kill the Kor'kron Jailer during Phase Two. Avoid being in front of or behind Thok at any point in the fight. Kite Thok in a sensible direction if you are being focused upon during Phase Two. Beware of the fiery void zones present in the Montak Phase One. The structure of this encounter allows your raid to very easily experience all the possible mechanics and phases, meaning that you can practice each individual aspect at your own leisure. To force Thok into Phase Two prematurely, simply tell your healers to keep everyone who takes damage below 50% health, and within two Deafening Screeches or so you should be able to enter Phase Two. This allows you to practice kiting the boss without having to go through several minutes of Phase One every time. Similarly, since the Montak Phase One is the most difficult one, and also the one we advise doing last (should your raid even reach it before Thok is dead), practicing it is important. So, you can simply choose Montak as the first NPC to free for a few attempts so that everyone can get acquainted with how the phase works. The Heroic mode of the encounter against Thok the Bloodthirsty plays out very similarly to the Normal mode fight. There are a few new mechanics, but what truly causes the strategy to change is the very tight tuning of the Heroic mode version. Thok has more health, and deals more damage in Heroic mode than in Normal mode. In addition to this, two new mechanics, and two changes to existing mechanics exist. The new mechanics both involve adds that spawn during the second and third Phases One, respectively. During the second Phase One, after the second Deafening Screech has been cast, a group of Captive Cave Bats will join the fight. These adds have a normal threat table, and their only ability is Vampiric Frenzy, a self buff that some bats gain and that causes them to deal damage around them and heal themselves for a part of that damage. During the third Phase One, after the second Deafening Screech, an add called Starved Yeti will join the fight. This add fixates on random locations around the room, charging towards them. Whenever he reaches a selected location, the Yeti chooses another one, and so on. Players who are in his path take lethal damage. In addition to these two new mechanics, two changes to existing mechanics are worth noting. Every time Thok kills an NPC during Phase Two, he heals himself for a very high amount of health. The healing is reduced by all Mortal Strike-style abilities. Moreover, it is worth noting that the player on whom Thok fixates during Phase Two takes damage from this fixate effect (the damage is not very high, but it requires healing). Before we look at the strategy changes that have to do with the increased tuning of the fight, let us quickly see how to handle the new, Heroic-only adds (since this is not very difficult). The Captive Cave Bats need to be picked up by the tank currently not tanking Thok, and your raid will have to AoE them down quickly. Stuns can be used to reduce the damage that the bats deal. The Starved Yeti has a very high health pool, making it inefficient to kill him. Instead, it is best that your raid leaves this add alive, and instead just avoids him for the remainder of the fight. The location to which the Yeti will charge is marked by a red pillar of light, so your raid members will have to always make sure not to be in the Yeti's path. Now, we can look at other changes that occur in the strategy. Basically, the strategy remains similar to the Normal mode strategy, but since everything is more difficult, your raid will have to execute the fight with greater precision. We will give you some guidelines and tips. Given Thok's very large health pool, you will want to drag out Phase One (the first Phase One, as well as the Frost-themed version of Phase One), for as long as possible, in order to give your raid as much time as possible to kill the boss. This means that you will have to go to great lengths to stay in Phase One until Thok reaches 25 or more stacks of the buff he gains each time he casts Deafening Screech. There are two important facets to this issue. Firstly, it is best to split the raid group up into two groups, neither of which is large enough to trigger the end of Phase One should all its members be below 50% health. For example, 2 12-player groups in 25-man (Thok's tank will not be in either group, since no one else should be in front of the boss) is a good option. This will ensure that Phase One will not be left accidentally. Secondly, your raid will need to make use of every single available defensive cooldown in its arsenal. While this includes all the usual defensive cooldowns, keep in mind a two of the more peculiar ones: Hand of Protection (makes the target immune to the damage of Deafening Screech) and Devotion Aura (allows healers to continue casting heals while Deafening Screech is being cast, without being interrupted). Once your raid reaches around 25 stacks, you should stack up inside a Power Word: Barrier or Spirit Link Totem and pass into Phase Two this way. Note that if Thok reaches 30 stacks, he will instantly wipe the raid. Note that you should not try to prolong the Poison and Fire-themed versions of Phase One. This is because these phases are extremely difficult for your raid (given the high damage done by Corrosive Blood and the fiery void zones, respectively). Instead, you should attempt to exit these phases as quickly as possible. There are two important tasks to perform during Phase Two. The first is making sure that there is a Mortal Strike-style effect on Thok each time he is about to kill the NPC that were released from a cage. This will greatly reduce the amount of healing that Thok receives. The second is employing an efficient manner of kiting the boss. The best way to kite him is to take him around the outside of the circular room, and to then take him all the way out to the end of the corridor connected to the room, before bringing him back in. Your raid members should make use of Warlock Demonic Gateways once Thok's movement speed is high. 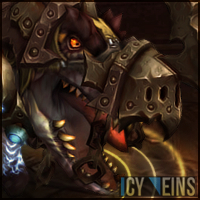 This concludes our raid guide for Thok the Bloodthirsty. We hope you have found it helpful. Please do not hesitate to post any feedback you may have on our forums. 08 Dec. 2013: Added Heroic mode strategy. 26 Sep. 2013: Added a link to the video guide, and added 25-man health values.